Future of Charity: "El Paso"
No sooner had he asked the question, my heart quickened. I immediately knew what I needed and wanted to do. I had oscillated long enough at the proverbial fork in the road, hesitating while the proverbial grass grew under my feet. It was time to take a step forward and enter religious life. Over the last several weeks, the theme of ‘steps’ continues to emerge in my prayer and daily life. And I am extremely grateful, because I believe “steps” to be a very healthy metaphor for discernment. I have no doubt that God is very close. As much as I try (and believe me, I do try) to control an outcome or determine the end result of any endeavor, I know that I am powerless to do so. I’ve also discovered (okay, maybe finally admitted to myself) that my decisions (and indecision) sometimes are overshadowed by a fear of failure. St. Peter and I have a lot in common. For both of us, attempts that might result in anything resembling failure feel threatening to our sense of security. To walk on the water, Peter had to take that first step… then another… and another… not knowing whether he would sink or swim, literally. When he stepped with faith, he was fine. It was when he stepped with fear that he faltered. My ego enjoys pelting me with the same discrediting doubt that Peter probably experienced: What if things don’t work out? What will people say and think? What if religious life isn’t a good fit? What if you’re not happy? But my God desires to comfort me with gentle, encouraging invitations that prompt me out of the boat: Let go. Keep your eyes on me. 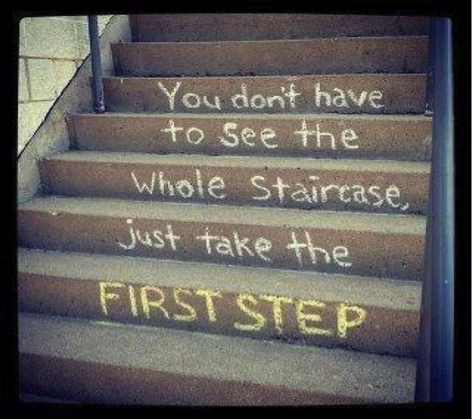 Take a step. I’ve got you. As unnerving as it can be at times, I am taking a step forward in faith. And it’s liberating! Just like Peter, I don’t know where this journey will lead (or end!? ), but I’m learning to trust the process. I’m learning to enjoy the journey and not the destination, as the popular saying goes. There’s no exhilaration at the end of a roller coaster ride, right? The excitement and elation occur throughout: anticipation as you ascend the summit, fear and adventure as you plummet into freefall, thrilling trepidation as your ride turns topsy-turvy at times… Any great ride or journey is accompanied by all of these feelings and more. But if we’re honest, it’s these emotions and experiences that cause us to feel the most ALIVE! I’m moving forward—not because I’m absolutely, positively, without-a-doubt, 100% sure that this is exactly where God is calling for the rest of my life—but because that small nudging voice keeps beckoning and inviting … Come! ... and because standing still in the same spot any longer is paralyzing and prohibits me from acquiring new information. Taking a step forward broadens my perspective and provides helpful and needed information to further discern my call and deepen my commitment. And as a good friend likes to remind me, “If you sit on the fence too long, you start to get splinters in your backside!” Touché. God winked… and I smiled back.